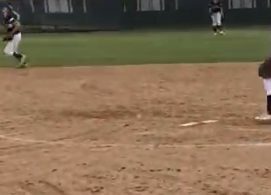 DEL CERRO (3-21-2019) – Although she’s only a freshman, Patrick Henry High designated hitter Olivia Giganti went huge. On Wednesday (Mar. 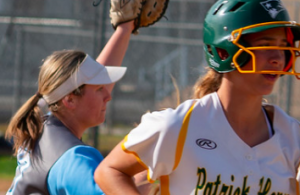 20), Giganti equaled the CIF San Diego Section record with three home runs, powering the 11th-ranked Patriots to an 8-0 pasting of Olympian in a non-league contest. Following a deep fly ball out in the 1st inning, Giganti drilled the ball three times to the same spot right-center field, only deeper, in her shots in the 3rd, 4th and 6th innings. She finished batting 3-for-4 with 4 RBI and 4 runs. Giganti becomes the 15th player listed in the CIFSDS Record Book to hit three homers. 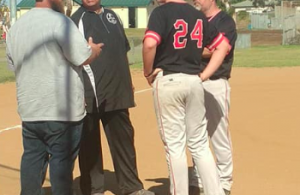 Among the others are a list of East County standouts, including Kelly Majam, Mountain Empire (2007); Sam Beasley, Steele Canyon (2007); Jessie Owens, Santana (2006), and Sarah Hicks, Grossmont (2013). Just last season, Ashleigh Hartwig of West Hills, also accomplished the feat. Kelsey Quist of Escondido’s Calvin Christian is the only player to twice achieve the feat (2003-04). Giganti now has four homers this year, putting her just off the pace to challenge the section single-season record of 17, shared by former USA national team player Lisa Dodd (University City, 2003) and Trina Harrison (Oceanside, 2008). There are two single-season East County record-holders, but by the same player. Carlee Wallace hit 15 as a sophomore for Foothills Christian for the small-school mark. She later transferred to Valhalla (after a year at Francis Parker) and slugged 13 as a senior for the Norsemen in 2013 for the large-school mark, despite sitting out a month based on the CIF transfer rules at the time. The CIFSDS career mark is shared by Harrison and Katiyana Mauga (Mira Mesa), who later became a 4-year starter for the University of Arizona when the Wildcats were ranked in the NCAA Top 10. In addition, shortstop Kaiah Altmeyer, another Patrick Henry frosh, also homered with a 2-run shot for her second round-tripper of the season. Altmeyer finished the day going 4-for-4, with 2 RBI and a pair of runs scored. Lost in the legends of long-balls was Patrick Henry pitcher Hailey “H” Jenks, The junior fired a 2-hit shutout at the Eagles, striking out 12 batters. She carried a no-hitter deep into the 6th. Jenks now has 32 Ks over 26.0 innings. Meanwhile, Edie Guthrie, a third baseman in her first varsity action of the season, batted 3-for-4 with a run scored for Patrick Henry (6-1). For Olympian (4-5), sophomore Arisa Tovar and freshman Katie Steinmetz recorded the team’s hits, Tovar’s single with two outs in the 6th broke up Jenks’ no-hit bid. SANTANA 12, OCEANSIDE 0: Sultans first baseman Joey Barkhimer belted a 3-run, walk-off home run Wednesday (Mar. 20), capping a 7-run rally in the 6th inning to run-rule visiting Oceanside in a non-league contest. “Bark” went park on a deep drive just to the side of the scoreboard in left field for the sophomore’s second home run of the season. Meanwhile, senior pitcher Madison Mendez fired a 5-hitter for her second shutout of the season. She moved t 3-1 after striking out 8 batters from the Pirates. Mendez also recorded a pair of RBI, including a solo homer. Four runs in the 2nd inning put away this victory early, as both Lakaila Aquiningoc-David and Hailey Justice both doubled for a 1-0 lead. The other runs in the rally came on a pair of passed balls and a throwing error. Santana (4-1) has posted 46 runs in five contests this season, averaged 9.2/runs per outing. Oceanside (4-3-1) had its 2-game win streak snapped despite two hits by left fielder Ashley Tuggle.